Fireplace units using different fuel types have very different heat outputs. Operating costs of fireplace units should be compared taking account of heat outputs, fuel costs per hour and fuel costs per kWh. The tables below compare typical units using different fuel types in terms of the above measures. The costs are based on current prices of particular suppliers in the Johannesburg region. Costs will vary depending upon the fuel supplier and the geographic region. All costs are subject to escalation, unfortunately at different rates for the different fuel types. The tables provide a comparison at April 2011. 2 x 48 kg cylinders (refill only) cost R2080 incl delivery, thus gas costs are R21,67 per kg. Open fireplaces burning wood and/or anthracite are not included above as there is little demand for these units at present. An open wood/anthracite-burning fireplace is considerably less efficient than a closed system fireplace. Wood-burning closed system fireplaces are the most cost efficient by any measure. Heat & Glo gas units are significantly more cost efficient than open gas fireplaces. A 5 litre bottle of fuel is taken to cost R177,00. The electrical costs above are obviously for electrical input, not heat output. The efficiency of the appliance will determine the heat output. Nevertheless, it is clear that electric fireplaces are the most cost efficient for small areas/volumes. Why Is A Clean Burn Fireplace More Efficient? Why Are Clean Burn Fireplaces Safer? With the current and future threat of load shedding from Eskom it is time to take stock of the alternatives to electricity as a primary source of fuel. With forethought there is no need to be without hot water, hot food or warmth in the event of power cuts. When cooking with gas there is no warn-up or cool-down time. The effect of an adjustment on the control valve is instantaneous on the pot. A gas flame is infinitely variable thus making temperature control (eg. simmering) far easier. Cooking uses relatively small amounts of gas. Most homes would use less than one 48kg gas bottle in a year on gas cooking, making this an economical source of heat. Although most gas cookers are equipped with an electric ignitor that requires mains electricity to function, the cookers will continue burning in a power cut and can be lit manually with a match or lighter. QAlternatively a small UPS system will provide enough power to operate the electronic ignition in the event of a power cut. Many chefs and restaurants insist on gas cookers as the convenience and consistency of heat is better. Most modern cookers have flame failure devices built into the unit which will switch off the gas in the event of the flame not being lit. This prevents kids playing with the gas or the potential of un-burnt gas escaping into the house in the event of a gas supply problem. This makes them very safe. Gas geysers do not preheat a tank of water but rather provide instantaneous heat when required. This means that energy is not wasted in heating a water tank when t is not being used. Think of the energy wasted in an electrical geyser when you are away for a few days or even for the 12 or so hours every day when people are not showering/bathing. Providing you have gas you will not run out of hot water in the event of high usage. Great for those times the teenagers have 30 minute showers leaving no hot water for the next person. When switched on the average geyser provides some 25kw of heat energy. This is equivalent to about 8 electric geyser elements running simultaneously to ensure a good volume of hot water. Gas geysers need to vent the fumes of the combustion to the outdoors. At peak hot water output they will burn over twice the gas consumption of a big stove, meaning that a lot of oxygen is consumed and a good amount of carbon monoxide/dioxide is produced. This means they must either be located outside the home or be provided with a flue to the outside. Very often a built-in fireplace is required to be installed in a position which does not have a chimney and the depth of the fireplace (front to back) is more than the thickness of the existing wall. Under these circumstances it is necessary to construct a chimney breast. The chimney breast houses the body of the fireplace and the flue up to at least ceiling height. Traditional construction of a chimney breast is in brickwork, which is labour-intensive and a somewhat messy activity, particularly irritating to the home occupants. 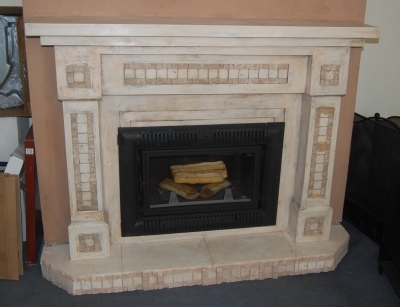 The Fireplace Shoppe has developed a system of installing a pre-fabricated chimney breast. The chimney breast is constructed of dry walling material capable of withstanding temperatures of up to 800 degrees Celsius. The completed installation is visually identical to a brick chimney breast. A pre-fabricated chimney breast can be painted or finished with cladding, depending on the aesthetic requirements.